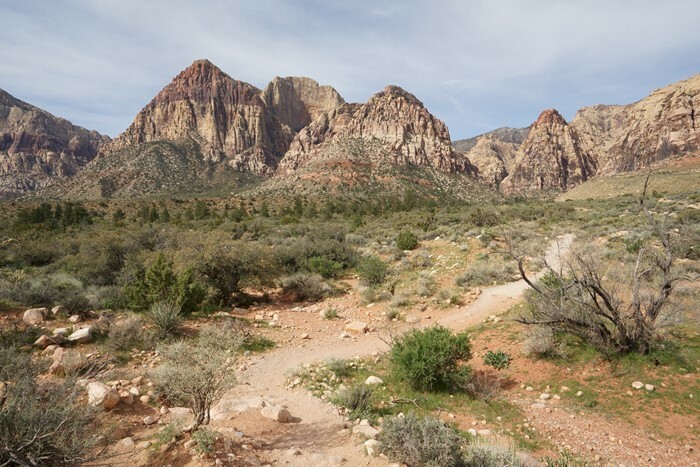 Pine Creek Canyon is one of the easier trails you’ll find in Red Rock Canyon, but it’s still quite rewarding and offers some beautiful scenery. 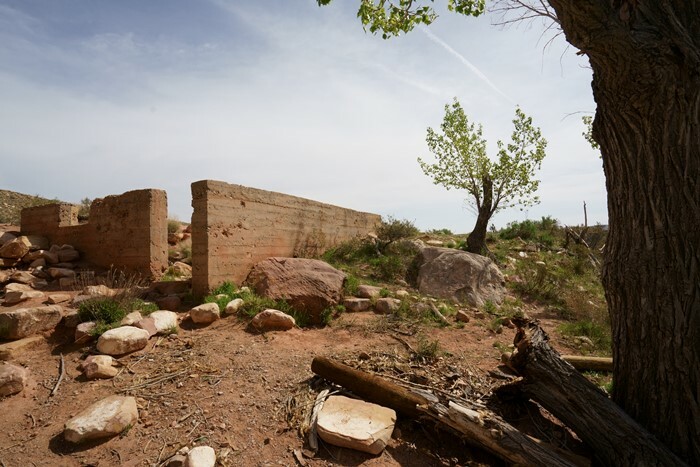 Except for one part, this 3-mile lollipop trail is pretty easy to hike, and you’ll get to see some interesting rocks and the ruins of an old homestead along the way. 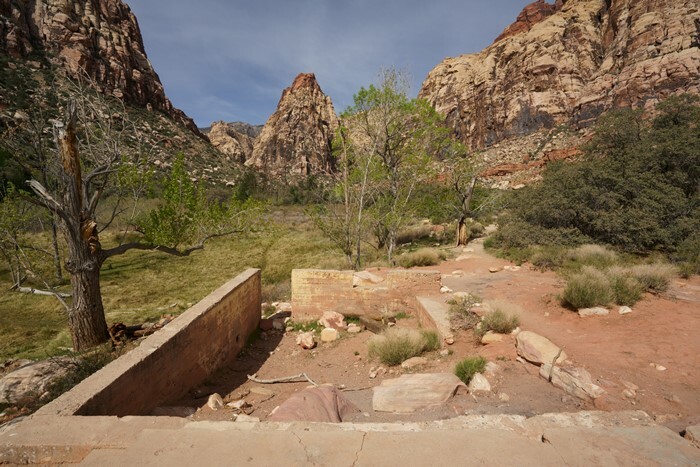 The Pine Creek Canyon trailhead is located at about mile marker 10 on the scenic drive. The trail into Pine Creek Canyon starts with a photo-worthy view. From the parking area, the trail drops down to a dry wash, curving ever so delicately towards the canyon. It’s the kind of photo spot that makes you want to hike down that trail, any time you see it. Once you make the short drop down and cross over the wash, you’ll start a very gradual climb across the open desert towards the canyon. It’s a pretty easy hike, and you’ll have no trouble following the trail. Along the way, you’ll encounter a short figure-8 loop off to the left-hand side. This diversion is the Fire Ecology Trail, and with a name that unexciting, I had no trouble passing it up. The loop takes you through an area that was scorched by a prescribed burn, which I assume gives you the opportunity to learn that fires can be helpful to the ecosystem. Once the canyon walls start to close in, you have an excellent view of Mescalito Peak — the pyramid that splits Pine Creek Canyon into two smaller canyons. I’ve read that there are a few routes that allow you to climb to the top of Mescalito Peak, however, it’s not an official park trail, and it sounds quite difficult (with some climbing and scrambling). Around this point, you’ll see the ruins of an old homestead (more on that in a moment), and the trail will split. This is where the loop portion begins. Keep going straight ahead for the easier portion of this loop route, which will take you on into the canyon. The loop portion of the Pine Creek Canyon trail nearly reaches the foot of Mescalito Peak. 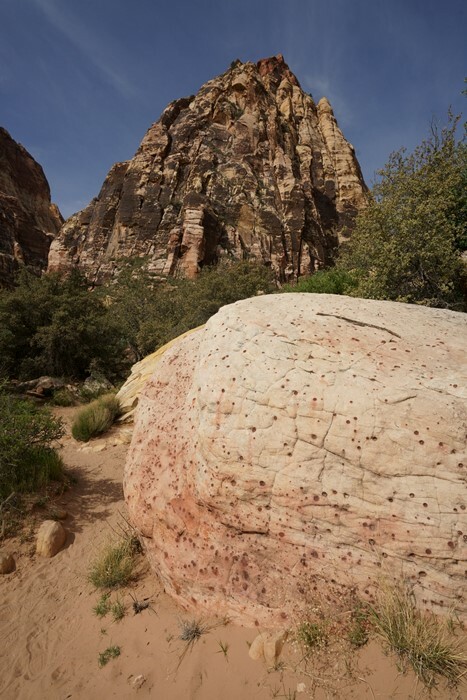 You’ll pass by this odd boulder, which is polka-dotted with red spots as if it contracted chicken pox. Beyond the polka-dot rock, the route becomes confusing. I tried to push further up into the canyon, but only found dead-ends. I could hear other hikers/climbers up ahead, but I have no idea how they got there. And, I was pretty sure that there wasn’t much of a point in going any further. So, I backtracked just a little and rejoined the loop trail. The next part of the loop trail was much more difficult than any other part of the trail. The return route crosses Pine Creek (which was a dry wash when I visited), then heads back towards the homestead on the south side of the creek. This part of the trail is very rough and involves pushing through some overgrown brush in some spots. There is also a lot more ups and downs on the trail. It’s not hard by any means, but I was surprised that it was so much different than the rest of the trail. And, there wasn’t any payoff for the extra effort — Pine Creek Canyon wasn’t more beautiful on this side. Earlier, I had walked right past the homestead without even noticing it. But, on the return side of the loop trail, you can’t miss it. This old house would have had an incredible view. Sadly, the foundation and the basement walls are all that’s left. Horace and Glenda Wilson built their home here in the 1920’s, and planted an orchard on the surrounding land. They sold the home after eight years, but stayed for another eight years as caretakers. After that, the home was abandoned and fell into disrepair. After you leave the ruins behind, rejoin the main trail. It’s about 3/4 of a mile back to the trailhead. This is definitely the least exciting part of the hike, because all the interesting scenery is now behind you. 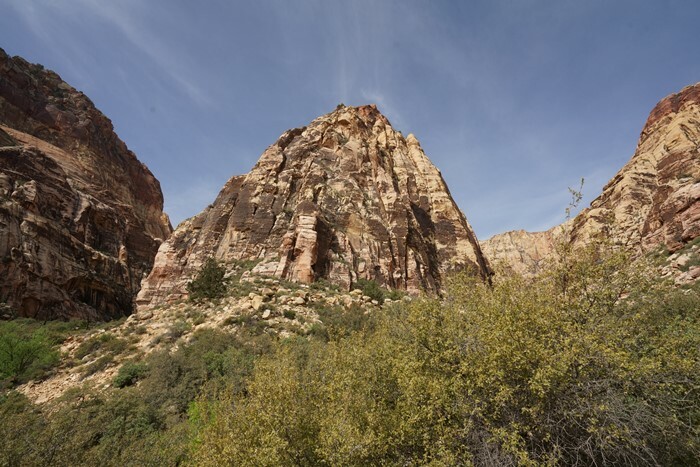 If you want to extend the hike, there are side trails that run north to Ice Box Canyon and south to Oak Creek Canyon. For most people, though, it would be easier to just drive to those trailheads and start a separate hike from the road. Pine Creek Canyon was my final hike in Red Rock Canyon National Conservation Area, before heading home from my long weekend in Las Vegas. It was a great way to end the trip — a trail that’s very scenic but not very challenging or time-consuming. 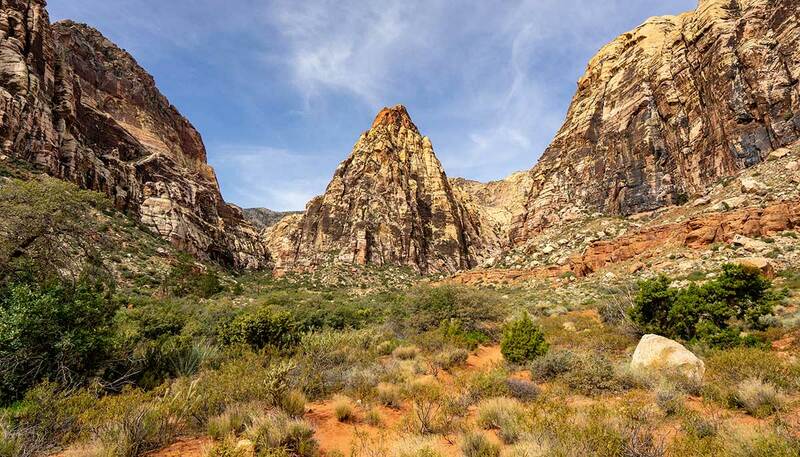 If that’s the kind of trail you’re looking for, you can’t go wrong with hiking Pine Creek Canyon.